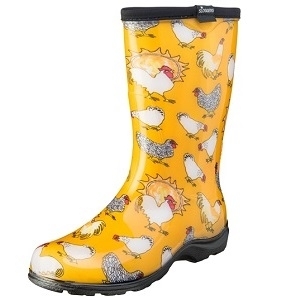 Attention all "Chickenistas", our Sloggers Women's Rain & Garden Boots in Bright Daffodil Yellow Chicken Print are sure to be a hit with "the girls"! Everyone's been squawking about these adorable chickens are from Vermont artist Sarah Rosedahl. They are lower and wider than most rain boots, there is more room to tuck your pants into. Just like the rest of our Sloggers MADE IN THE USA boots and shoes, they include our "All-Day-Comfort" insoles and our signature deep lug sole for great traction in wet and muddy conditions. Our boots are made from 100% recyclable, medical grade material, so they have a soft feel and no odor (like the China stuff), and they are easy to hose off clean. Made in the USA. Always was.